Interoperability of railway high speed operations at a European scale relies on an unprecedented change in the field of signaling systems. This change is called ERTMS/ETCS (European Rail Traffic Management System/European Train Control System)! The last decades had known a significant technical progress in the railway industry, helping the gradual transition to ERTMS we observe today, which intends to replace the around twenty different and mutually incompatible signaling and train control systems that exist in Europe. I. How does it work? Level 1: The train receives its movement authority via ground beacons; this movement authority is calculated by the control center according to the occupation of the following sections. Level 2: The train is localized using ground beacons and transmits its position to the control center via GSM-R. The control center communicates the movement authority according to the occupation of the following sections. Level 3: The train is localized using ground beacons, exchange data with the control center and determines itself its movement authority depending on the position of other trains. Other levels were planned as well, such as level 0 or STM for, respectively, non-equipped lines or the ones equipped with national systems. Besides, train detection for the effective levels 1 and 2 is provided by track circuits or axle counters. A continuous speed control concerning both the speed limit of the line section where the train is located and the speed curve that the train must respect during its braking sequence. A cab signaling which indicates continuously the real speed and the speed limit and which is able to warn the train driver in case the speed limit is violated. Actually, the track side equipment translates a number of useful data including sections speed limit, line profile (slopes and ramps), target speed and target location to a Movement Authority and transmits it to the on-board equipment. Based on this information, the on-board computer calculates several curves serving to inquire the speed control about speed limits and inform the driver. Ultimately, safety requirements are met thanks to the determination of the emergency braking guaranteed performance. For the on-board computer, this performance is materialized by the EBD curve (Emergency Brake Deceleration), which describes, in a space-speed map, the limit trajectory (limit target location) that enables the train to reach the target speed. 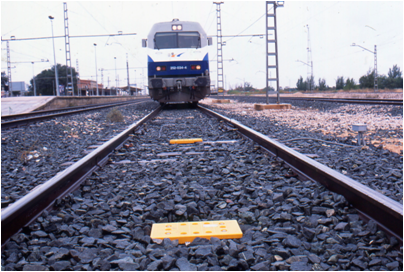 The EBD curve enables the train to know the distance necessary to stop from the time the on-board equipment would command the intervention of the emergency brake. This distance determines a location called EBI (Emergency Brake Intervention) i.e. the point beyond which the train control will bypass the driver. Accordingly, the ERTMS/ETCS equipment ensures safe movement of the equipped train at any time. To learn more about ERTMS/ETCS, find out the ERTMS handbook here. The bias is known as De-nominator bias in the risk literature when the safety analyst makes an assertion that likelihood of risk of a fatality is improbable because the safety integrity of level of SIL4 has been reached. This error in risk judgement arises because the analyst is not informed of the consequences of such biases has on decision making and leading to neglect probability of train collision on ERTMS Signalled Railway Network. This neglect of probability of this bias is called latent error in the language of Prof James Reason, inventor of Swiss Cheese Model.